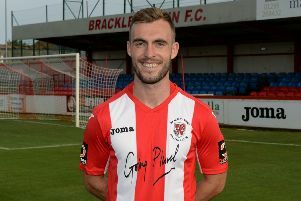 Brackley Town boss Kevin Wilkin had no complaints after seeing his knocked out of the Emirates FA Cup. Evo-Stik Northern Premier League side Marine beat Saints 3-2 in Saturday’s third qualifying round tie. On-loan 18-year-old Finlay Sinclair-Smith scored twice, at the start and end to the first half, with James Murray also on target in between. Adam Walker and Matt Lowe got Saints back in it in the second half but they were unable to force a replay despite their late pressure. Wikin said: “Naturally it is a disappointing result. The way we played in the first half and the attitude we showed from the outset was really poor.